Is Jimmy Carter a fan of the Lost Cause myth? Kevin Levin founded the blog, Civil War Memory. Todd Groce’s chapter on the Georgia Historical Society’s Civil War 150 Historical Markers project explores some of the challenges of re-interpreting the Civil War – specifically Sherman’s March – throughout the state. That there was some controversy involved will come as no great shock, but you may be surprised to learn where some of the push back originated. What follows is Groce explaining what happened next. 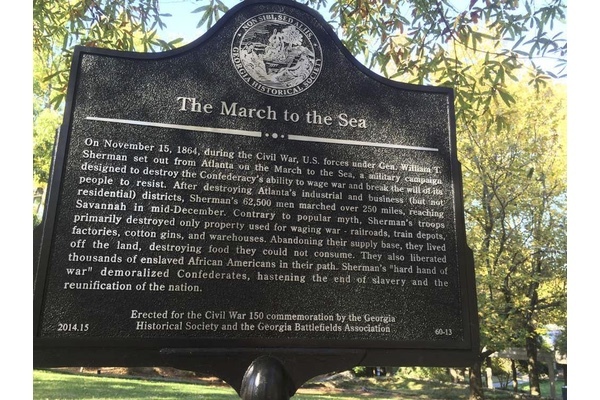 In May 2015, former President Jimmy Carter wrote a letter asking that the March to the Sea marker on the grounds of the Carter Center in Atlanta be either moved or -re-written to reflect a more traditional Lost Cause interpretation. The marker had been approved the previous year by the Carter Center and had been in the ground for seven months when, for reasons unclear to us, we received this letter from President Carter reversing course. Despite a reply letter from GHS citing the extensive scholarly sources used to compose the marker text, President Carter remained firm in his request. With the blessings of the city of Atlanta, GHS relocated the marker to nearby Freedom Park, only a few hundred yards away from its original location, and left the text unaltered. As it turned out, the marker probably is more widely read and more accessible in a busy city park, visited by tens of thousands each year, than when it was located on private property. With relatively few words this marker certainly packs a punch. References to “Contrary to popular myth…” and the qualification that the destruction Sherman wrought was qualified is no doubt tough to swallow for some, but I still find it difficult to explain President Carter’s response. I certainly never took him for a Lost Causer. Perhaps someone with influence in the Carter Center pushed him to speak out. Again, I don’t know. But it does highlight that you can never be certain of where to draw those fault lines in our Civil War memory.